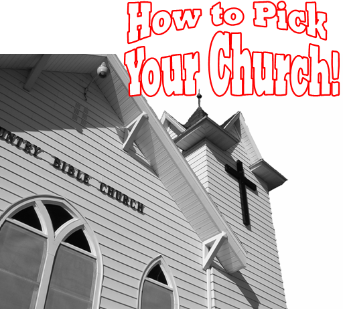 HOW DO YOU PICK A CHURCH HOME? OBSERVATION: How do you pick a church home? If you are a new believer in Jesus Christ, or if you have moved to a new area, this is a question you may be facing. The Scriptures call each and every believer to be planted in a local fellowship of believers. A special blessing is promised for those who are “planted” in the house of the Lord (local church family). So how does one find where the Lord wants them to be “planted”? This was a question that the woman at the well was asking Jesus. The woman’s question to Jesus focused on the “location” of worship. Jesus’ answer focused on the “heart” of worship. The answer to the woman’s question had nothing to do with location or outward expressions of worship. The answer to the woman’s question had everything to do with her heart and God’s truth. So how do we apply this to our initial question? How does this help one pick a church home? It reminds us that the criteria for the local fellowship of believers that the Lord is calling us to be planted in has nothing to do with what we see. It is not about the building. It is not about the programs. We do not pick a church home based on what it has to offer us. We are not shopping for a car that has the most amenities or features. We are earnestly looking for where the Lord is calling us. We will never discover the place where we can grow and be used of the Lord to our fullest potential if we are looking to the outward appearance. We must always remember that finding our church family is a matter of the spirit and truth. In reality, we are not supposed to “pick” a church home, we are supposed to be “planted” in a church home. This means that it is the Lord’s will and direction that is of utmost importance. It must be where the Spirit of the Lord is leading us, and where the truth of the Lord is proclaimed and honored. The Holy Spirit will never lead us to a place of imbalance if we are listening clearly to His voice and abiding in His Word. The Holy Spirit will lead us to the family of faith that God has prepared for our benefit and for the mutual benefit of those we are being called to join together with. A recent story that was told to me illustrates this very well. A professional shared with me his family’s search for a new church home. They had moved to a new area and were seeking a new church home for their family. They visited a small church and the man immediately sized it up. They did not have many people their own age. There were no programs for their children. When they left from their visit he proclaimed – “We won’t be coming back to this church!” Then something happened. The Holy Spirit began to deal with this man’s heart. He couldn’t escape the leading of the Spirit, as he was sincerely seeking the Lord. When he told his wife they should go back and visit again, she was shocked. Then something wonderful happened. Their second visit the Lord revealed to him that this was their new church home. They were not being called here because it had everything they were looking for on the outside. They were being called here because it was where the Lord knew they could both grow and offer their gifts to help others grow. Fast forward – now there are many families their own age. There are more children, and a growing children’s ministry. And they are right in the middle of it, serving, giving, and receiving. He told me that this would have never happened if they would have chosen a church the way one chooses a car. So, are you looking for a new church home? Are you dissatisfied with your existing church home? Don’t look toward the outward appearance – seek the Holy Spirit’s leading. Finding a church home is not really about us – it is about Him! It is seeking His will to be planted where we can truly become connected with others in His Kingdom purposes. Remember – it is not on the mountain, nor in Jerusalem – it is in spirit and in truth that we discover the will of the Lord for our lives! Seek the Lord and He will guide You. Bloom where He plants You. Don’t look at what you don’t have – look at what He can work in and through You to bless others. This is where you will truly find fulfillment and joy! This is when you will know you are planted in the fellowship of believers He has called you to!